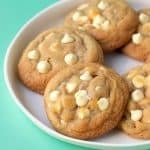 Buttery white chocolate chip cookies made from scratch. Preheat the oven to 180 C (360 F). Line two baking trays with baking paper. In a large mixing bowl, add the butter and sugars and beat using an electric beater for a minute or two until smooth and creamy. Add egg and vanilla and beat until combined, scrapping down the sides. Add flour, baking soda and beat again until a soft cookie dough forms. Add the chocolate chips and stir. Spoon 1.5 tablespoons of dough into small balls and place on the baking trays, leaving room for the cookies to flatten out. Place in oven for 10-11 minutes or until golden brown on the edges. Leave to cool for 5 minutes before transferring to a wire rack to cool completely. Sprinkle with sea salt.